Stranded, Luke makes repairs to the Landspeeder, but the vehicle needs coolant. Threepio and Artoo offer up their own coolant, enabling Luke, Han and Chewbacca to evade a nearby Imperial patrol. Han worries that the droids' coolant won't last long, but Luke says they only need to reach the ship he flew to Tatooine. When they arrive where he landed the ship, however, they discover Jawas picking it apart. Han trades the droids for passage to Mos Eisley aboard the Sandcrawler, promising Luke he'll use some his bonus from Jabba to buy them back. En route, the Sandcrawler is attacked by Stormtroopers, who believe Luke and Han to be aboard. They fight off the troopers, after which, they stumble across some strange machinery in the desert. As they inspect the equipment, Luke suddenly orders everyone away, just before the machinery activates, freezing everything in its vicinity. 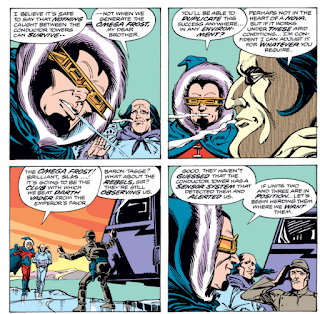 Shortly thereafter, Baron Tagge and his entourage arrive, and he congratulates his brother on the creation of Omega Frost. 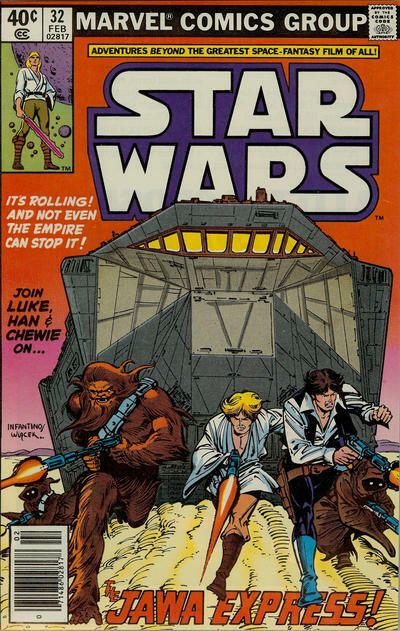 They then target the Rebels, and Luke and Han are forced to once more defend the Sandcrawler from Imperial forces. They escape, but realize they can't arrive in Mos Eisley aboard the Sandcrawler now that the Empire knows they're in it. However, Threepio, revived by the grateful Jawas, announces that there's enough coolant aboard the Sandcrawler to repair their landspeeder, thus enabling them to better sneak into the city, and from there, to the Millennium Falcon and offworld. 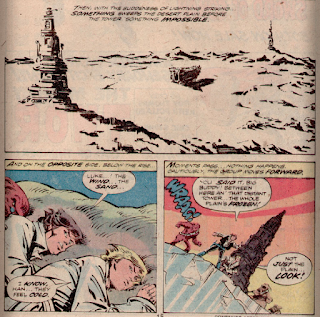 Teased last issue, this issue reveals the nature of Baron Tagge's new weapon, the Omega Frost, a device which quickly freezes anything caught in its range, even in the high heat of Tatooine. It's basically a big freeze ray, though it definitely has a cool name. Tagge expects that with it, he'll be able to challenge Darth Vader's position within the Empire. A pretty lackluster conclusion to Luke's return to Tatooine. The stuff with the Jawas is fun, and certainly in keeping with the "here's some callbacks to Tatooine-based stuff from the movie!" bent of the story, but otherwise, everything wraps up rather perfunctorily (it's basically "heroes run out of gas, stumble across some bad guy plans, cut a deal to get some more gas, go home"). The details of Baron Tagge's latest plan are revealed, but any further development of that idea or those plans are left for future issues. Even more frustrating, there's no payoff to the Fixer/Camie stuff from the previous issue, specifically the fact that Fixer sold out Luke to the Empire. After a strong and promising previous issue, it's a shame that Luke's return to Tatooine is over so soon, and so blandly. I imagine Baron Tagge's doom by the Emperor would be not pretty if Tagge had succeeded in killing Vader, especially as Tagge would not be remotely worthy of apprenticing under Palpatine. To be fair, even later in the EU, circa SHADOWS OF THE EMPIRE, Prince Xixor was vying with Vader for Palpatine's attention, and it was established Palpatine enjoyed playing them against each other. 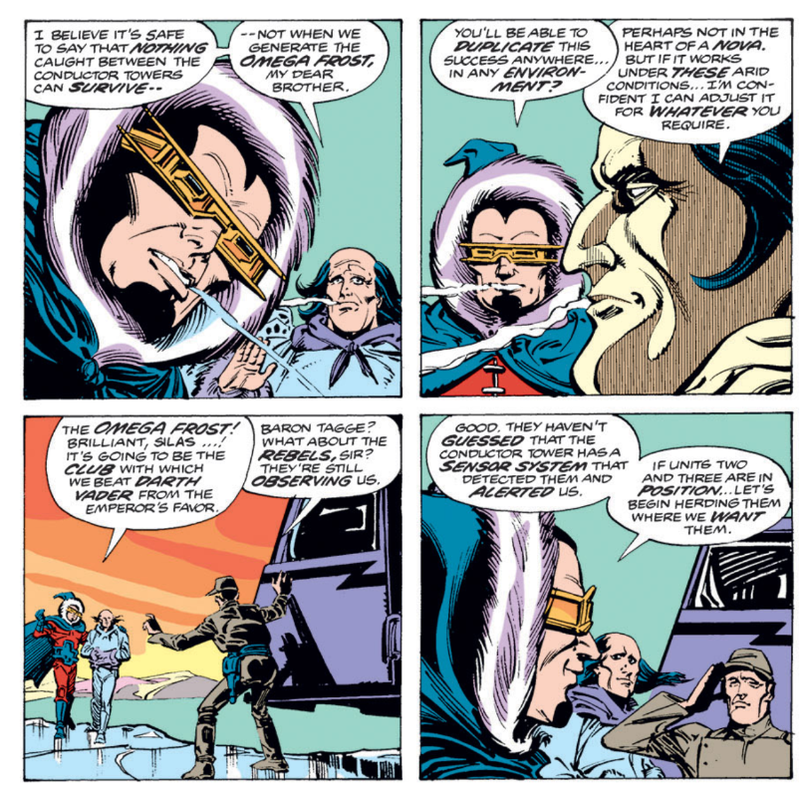 I don't know that he'd ever fully abandon Vader, but it seems evident based on later stories that he likes to keep him insecure about his position as the "favorite". “Omega Frost” sounds like a new Amalgam mash-up of Darkseid and White Queen. 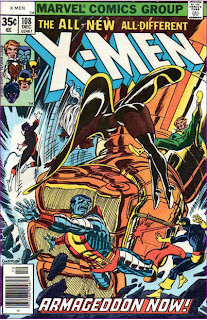 "As leader of the Apokalips Club, Omega Frost is in constant battle with Highfather Xavier for the souls of New Genetics like 'Scott Free' Summers…"